There are lovely easy to make desserts which take little time and make scrumptious bites! 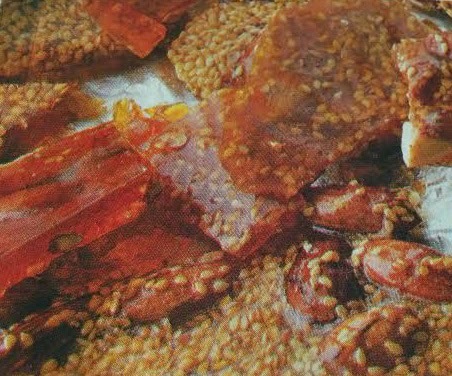 I love the taste of the delicious pralines infused with the taste of sesame seeds to have in jar ready for quick fix bites! Place sugar, almonds and sesame seed in large, heavy-based frying pan or saucepan. Cook over low heat, gently stirring occasionally until sugar is melted and mixture is golden brown (don't let the sugar burn!). Immediately pour out onto lightly oiled baking tray; quickly tilt tray to spread mixture thinly and evenly. Stand until set. Break praline into bite size pieces with a wooden spoon. Store in an air tight cool, dry place.